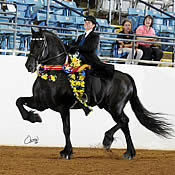 USEF Announces the 2011 USEF Horse of the Year Candidates; Voting Is Now Open! Lexington, KY – To reach the highest level of excellence in equestrian sport takes talent, perseverance, a tremendous spirit and often, unwavering courage. In 2011, six horses have shown the world those qualities and more. And on January 13, the United States Equestrian Federation (USEF) will bestow two of them with the prestigious title of Horse of the Year, the highest honor the USEF awards a horse. This year – a change from years past – both a national and international horse will win. The six champions have earned their place on the elite list as USEF Horses of Honor, and each will be recognized at the USEF Horse of the Year Awards gala and dinner in January – part of the USEF Annual Meeting – at the Hilton Cincinnati Netherland Plaza in Cincinnati, OH. It will be up to you to choose the two special horses, selecting from a range of talents and from across the Federation’s breeds and disciplines. Your vote will help determine the champions that join the pantheon of past winners including reining horse Gunners Special Nite (2010); dressage horse Ravel (2009); driving horse Jamaica (2008); eventer Theodore O’Connor (2007); show jumper Authentic (2006); and dressage horse Brentina (2005).